One of the most highly anticipated new standards in many years, SuperSpeed USB (USB 3.0) is the next advance for the widely adopted Universal Serial Bus (USB) standard. The key performance upgrade of SuperSpeed USB is an increase in the data rate from 480Mb/s to 5 Gb/s--ten times faster than USB 2.0. However, the higher speed and more complex features create more complicated signals that require more sophisticated measurement and analysis. Developers face additional requirements in the new specification that blur the boundaries between physical layer testing and protocol layer testing. Teledyne LeCroy’s leadership in oscilloscope and protocol analyzer technology, serial data expertise, and tradition of innovation, ensures a complete suite of SuperSpeed USB test solutions that address today’s challenges and anticipate increasingly integrated test methodologies. Successful development of new USB 3.0 products requires a coordinated test program, running from transmitter testing (to verify eye diagrams, jitter, and other performance measurements), to receiver testing (to ensure reliable data transfer), to TDR testing (to ensure reliable channels, PCB designs, connectors and cables), and finally to protocol testing (to ensure functionality and compliance to USB 3.0 requirements). 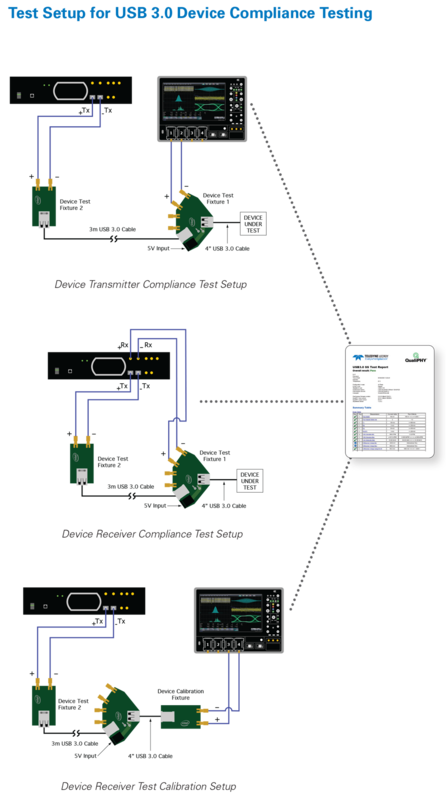 Teledyne LeCroy is the only company that offers a complete line of USB 3.0 test solutions covering transmitter test to protocol test, and every step in between for comprehensive verification, debug and compliance. SuperSpeed USB test needs are supplied with a single point of procurement and support. Further, Teledyne LeCroy provides uniquely integrated test solutions that combine test capabilities at multiple levels and merge the results for more accurate and meaningful information. Teledyne LeCroy’s experience and leadership in providing high-speed serial data test tools make Teledyne LeCroy the natural choice as a test partner for SuperSpeed USB development. Teledyne LeCroy’s test tools cover the full range of test needs: industry-leading oscilloscopes for transmitter testing, unique products such as the Protocol-enabled Receiver and Transmitter Tolerance Tester (PeRT3), specialized solutions for TDR testing on sampling oscilloscopes, and a full line of serial data protocol analyzers. Our test tools are not only superb in their own test areas, but because they are well integrated with each other, they help engineers easily move test designs and results from one Teledyne LeCroy system to another providing quicker and deeper insight for confidence in measurement results. The PeRT3 Test System, which integrates receiver test with protocol-awareness, provides the ability to automate testing through active control of the device under test, and to integrate diverse test results from multiple levels. It is also able to easily manage through protocol issues such as SKP symbols which can interrupt testing on competitive products. QualiPHY, Teledyne LeCroy’s automated test engine, is the only solution that fully integrates and automates transmitter and receiver testing. QPHY-USB3-Tx-Rx permits the scope to communicate directly with the PeRT3 automating both instruments and creating compliance reports that include both transmitter and receiver results. Teledyne LeCroy provides the right tools for you every step of the way. Our coordinated solutions guide you through the most difficult engineering and development tasks and help ensure product goals of performance, quality, reliability and time-to-market are all met. Developed and promoted through the USB Implementers Forum (USB-IF), USB has been long established as the interconnect system of choice for peripheral systems. SuperSpeed USB is backwards compatible with USB 2.0, ensuring a smooth adoption path for all users. However, for developers the challenges of USB 3.0 are daunting. High-speed gigabit serial data links require new design approaches, high quality manufacturing processes, and comprehensive testing and debug procedures to achieve reliable data transfer and interoperability. 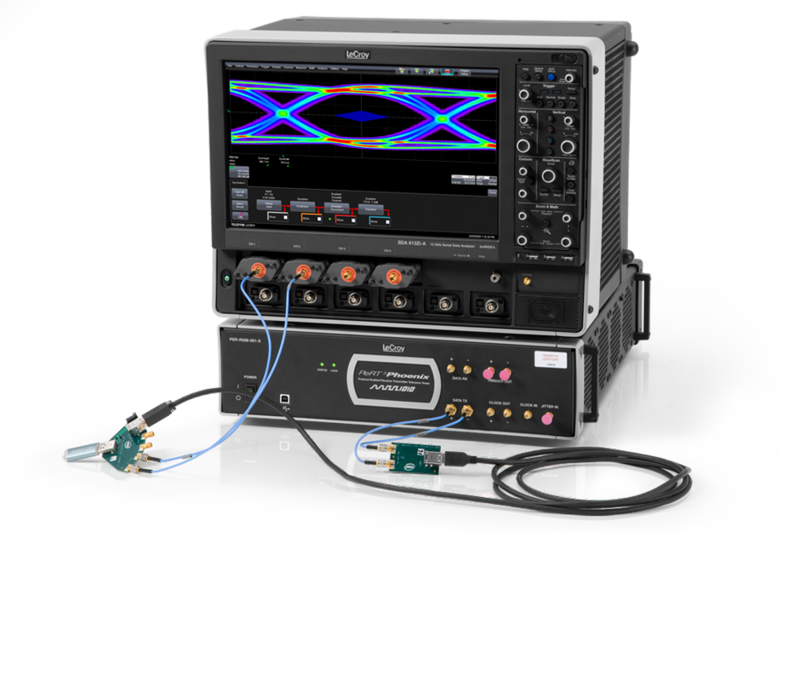 The SuperSpeed USB Compliance Test Specification requires the use of reference channels and continuous time linear equalization (CTLE) for compliance measurements. The SDA 813Zi with the Eye Doctor II analysis package has the ability to emulate the reference channel and the CTLE as specified for both compliance measurements and to troubleshoot the root cause of compliance failure. Another of the new SuperSpeed USB capabilities is Optimized Power Management which requires all devices to actively manage power (sleep states, etc.). The development and test of this feature requires equipment that is able to simultaneously monitor both physical and protocol levels. The Power Tracker option for the Voyager USB 3.0 Protocol Analyzer simultaneously captures both protocol traffic and power consumption, allowing engineers to quickly isolate and identify problems in ensuring compliance to the new power management requirements. 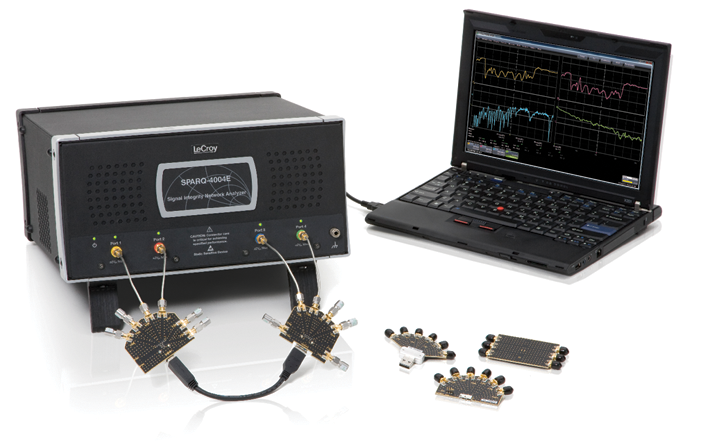 USB 3.0 Tx, Rx and cable tests that measure insertion loss, impedance and crosstalk measurements can be made with the Teledyne LeCroy SPARQ Signal Integrity Network Analyzer. SPARQs are TDR/TDT-based analyzers that measure S-parameters with a single button press, and at a fraction of a cost of a VNA. Fully calibrated measurements can be made in minutes, and without any need to connect or disconnect cables to calibration kit standards or electronic calibration modules. Teledyne LeCroy’s Voyager USB 3.0 protocol verification platform is an essential test system for teams designing Certified USB 3.0 products. 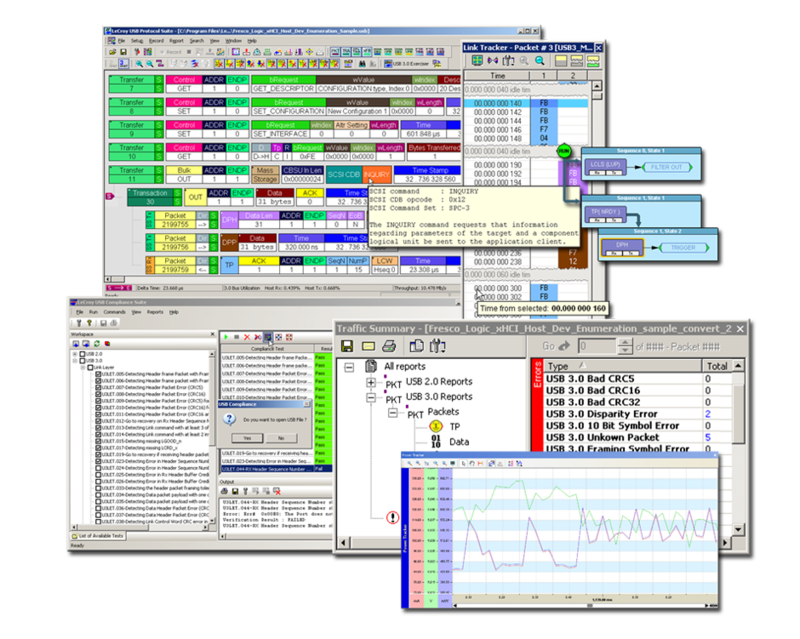 A full function analyzer, it is capable of recording and analyzing traffic between both USB 2.0 or 3.0 devices. The integrated exerciser is capable of emulating USB 2.0 and 3.0 device behaviors to allow functional, reliability, and performance testing. By leveraging Teledyne LeCroy’s expertise developed for our PCI express 5 Gb/s protocol testers, the Voyager has emerged as the preeminent system for USB 3.0 compliance verification.